It's been almost 23 years since the first BON JOVI album saw the light of the day and reached the US Top 40. From that point every album composed by the Jon Bon Jovi/Ritchie Sambora collaboration climbed the first places of the major Top selling charts. It is also known that Slippery When Wet became the biggest selling album in 1987, selling 9 million copies. In the late 80s the band embarked on a huge tour lasting almost 16 months eventually exhausting BON JOVI and leading them to silence. 1992 was marked the return of the New Jersey band that released Keep The Faith presenting a very different look away from hairspray, long hairs and tight jeans. The year is 2007 and BON JOVI return with the successor to the quite successful Have A Nice Day released in 2005. 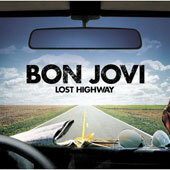 There has been a small argue throughout the music media regarding the country influences found in Lost Highway. The album opener is far for being the up-tempo and uplifting song like Have A Nice Day or Bounce. The clean guitar arpeggios, the bottleneck guitar and some banjo tunes create a driving melody while Jon sings having a lower pitch than usual. The first signs of distortion come with the second track Summertime. It is rather a mediocre song with a happy main melody, a pretty groovy rhythm and a disappointing guitar solo taking into account Sambora's rich past. The first video out of the new album is the ballad Make A Memory where Jon delivers his warm and powerful vocals while Sambora presents some nice leads and fills. Whole Lot Of Leaving brings the country influences in front with a lot of sliding and a clean rhythm guitar. We Got It Going On is a more of a classic BON JOVI song with groovy uplifting rhythm, the classic voicebox during the solo and a catchy sing-along chorus. Any Other Day is nothing really special apart from the good old recipe with Sambora's solo and Jon's vocals. Seat Next To You is a mellow ballad that in some strange way reminds me of QUEENSRYCHE's Silent Lucidity which is the only good thing I could say about this track. Everybody's Broken is nothing special while Stranger features the strongest country influences of the album; to top things off there is a guest appearance of Mrs. Le Ann Rimes with the classic female country voice. Last Night comprises nothing more than a catchy chorus while One Step Closer and I Love The Town continue on the new BON JOVI path through the country territory. If you're looking for another classic BON JOVI album then take a step back! This is merely a rock album with a country atmosphere all over it that makes too difficult to get used to (at least for me). I'd prefer this album would be under the JON BON JOVI moniker as a solo release because it would abate my disappointment. This album is so non rock that it makes questionable its presence in the Metal Temple site.